That ellipsis is mine, as it goes on from there. Natalie has to navigate this minefield and try to find someone to befriend and trust, two things that do not necessarily go hand in hand in this situation. Because other people are unknowable. And in a way, Natalie is unknowable, to either herself of the reader. The back cover of this PMC edition states that Natalie’s “identity gradually crumbles.” From the start she doesn’t know who she is, and her college experiences only confound this. There is a lot of wonderful free indirect speech within which we get glimpses of Natalie’s lack of surety and confidence in herself, including some wonderful moments musing on whether or not she is really Natalie at all. But Natalie does make friends, for better or worse, and in the last third of the book meets “the girl Tony”, a mysterious figure who appears almost like a nymph or a fairy… or something darker. The reader is not quite sure, and neither is Natalie.The middle of the book is mostly concerned with college life, and Natalie starting to move from girl to young woman, and towards the end of the book, with Tony, Natalie seems to retreat more and more into her own mind. The weirdness gets weirder, and though this could have made the whole thing fall apart, Jackson manages to have enough control that there is still a coherent thread throughout. The last section of the book is the oddest of all, and we wonder which parts of it are real and which parts are in Natalie’s head. 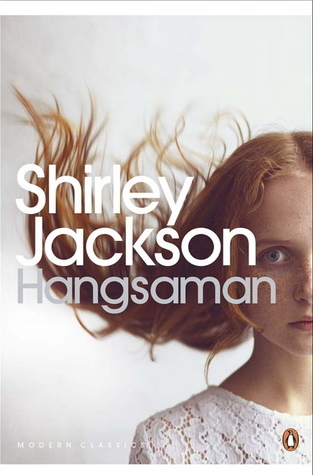 Mostly I was left wondering about the connection with the line on the back of the book, that says Hangsaman was “inspired by the unsolved disappearance of a female college student near Shirley Jackson’s home”. I’m still thinking about how that applies to the story, and I think there are multiple layers here that I will only manage to uncover over time, as I think about the book more and it sinks in a little. It is quite an intense book, and you’ve got to get comfortable with it, and used to it, to really get it I think. All cover images from GoodReads, by the way. Also I’m not sure if there were any new editions between 1976 and 2013 – there must have been. Research needed. Who else has read Hangsaman? Thoughts? Originally published in 1951. I read the 2013 Penguin Modern Classics edition, pictured above.